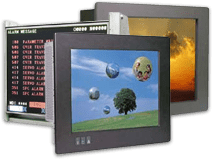 Dynamic Displays offers a complete line of LCD replacements for the old CRT monitors found in Allen Bradley manufactured CNC machine systems i.e. Allen Bradley 9 Series CNC Machine, Allen Bradley Plant Floor Terminal 1784 T30C, Allen Bradley 9/230 & 9/240 Series, Allen Bradley 9/260, 9/290 & 9/440 Series, Allen Bradley CNC Monitor 8520-CRTC and Allen Bradley CNC Monitor 8520-CRTC1. Because many of these systems date to the early 80’s, equipment owners find it very difficult to find replacements for their Allen Bradley Monitors. In some instances, even Allen Bradley no longer supports the particular CNC Machine or system. Because many of these systems date to the early 80’s, equipment owners find it very difficult to find replacements for their Allen Bradley Monitors. In some instances, even Allen Bradley no longer supports the particular CNC Machine or system. Now Dynamic Displays has LCD retrofit Allen Bradley CNC Monitors to replace the old CRT monitorsin existing Allen Bradley equipment. Dynamic Displays industrial LCD replacement monitors are designed specifically for and provide an alternate solution to old worn out CRTs and refurbished CRT replacements with a very short life expectancy. Our replacement solutions are brand new, in stock, provide a sharp clear image, are manufactured in the USA and carry a full year parts and labor warranty. If you have a need for an Allen Bradley Monitor Replacement please email or call us to find out more.